Farleigh Hungerford Castle, a few miles to the south of Bath, is a ruined reminder of an age when an English knight’s home was his castle. The manor at Farleigh was first fortified by Sir Thomas Hungerford in 1370 (he got into trouble for doing this without permission). Nowadays the castle ruins are not particularly extensive, although two towers, walls, a gatehouse, crypt and fourteenth-century chapel are standing. The chapel contains grand tombs of the Hungerford family and a fresco of St George. The castle, situated in the small village of Farleigh Hungerford, is managed by English Heritage. A good audio-guide is available to help visitors find their way around the site. As well as the historical interest, part of the appeal of visiting Farleigh Hungerford is the green countryside setting, and the opportunity to get a taste of the rural landscape which surrounds Bath. The best days to visit are when there is a special event. 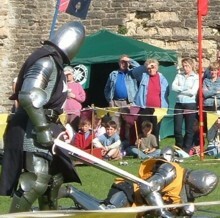 English Heritage organise a great series of historical re-enactments, plays and fairs. Children will love the colourful knights and storytellers. It’s not all fighting, though – events are educational, too, and children (sometimes adults as well) may have a go at historical activities such as dancing or archery. There’s always fun as well as learning as the knights, damsels and minstrels bring history to life. 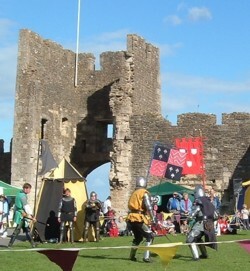 A calendar of events can be found on the English Heritage website. Farleigh Hungerford is 9 miles south-east of Bath. Unfortunately there is no public transport connection; the easiest ways to arrive are by car or taxi. There’s a car park at the site. Otherwise, the castle could be incorporated into a country walk. The nearest stations are at Avoncliff (2 miles) and Trowbridge (3½ miles) and the nearest bus stop is over a mile away (served by buses from Trowbridge).